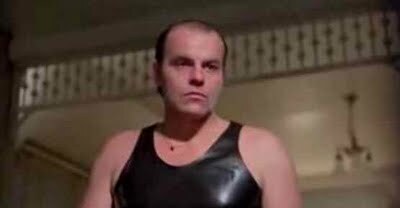 Michael Ironside (aka “The Sides”) is a psycho killer-slasher who loves him some stalking but will totally kill any bonus victims he can get away with. He gets super stoked about killing and wears a creepy black tank top that contrasts nicely with his uncooked-bacon complexion. Shatner shats around and overacts as usual and The Sides is killed by some 45 year old victim who outwits him. I like that they don’t waste too much time on Ironside’s origin; they show three short flashbacks that give you enough room to infer that he was molested by dad and witnessed domestic violence that inspired his hunger for murder. Is it scary? Nope. Not at all. Watch Shatner fumble through this mess and lol at the Sides’ impulse kills and weird stalking.